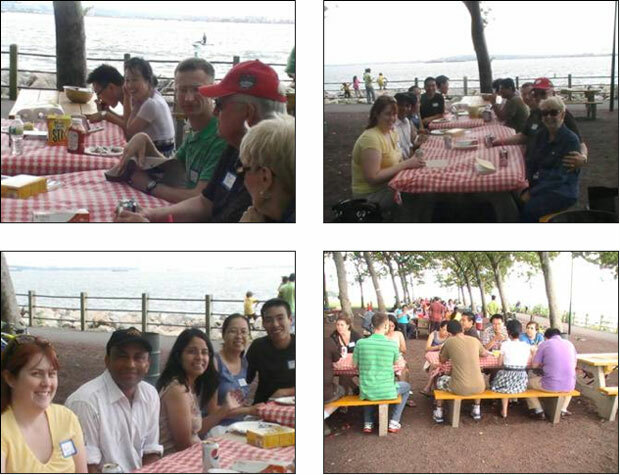 The 2011 Annual Younger Chemist Committee mentoring picnic, co-hosted by our parent chapter, the NJACS executive committee, was held on Sunday, June 26 at the Liberty State Park. 22 members and friends joined the event and enjoyed the great BBQ food, the good weather, and a great view of New York City from the site. Young chemists and students took this opportunity for academic networking among themselves and with mentors of senior chemists such as Emmanuel Aouad, NY/NJ Chapter President of the Professional Advancement of Black Chemists and Chemical Engineers (NOBCChE), and Bill Suits from NJACS executive committee. This is the fourth consecutive year that the YCC has participated in this event and we hope to help make it even bigger and better next year. We were also able to take advantage of the opportunity to introduce our group to local college students and expand our membership by 10 people new members. We would like to thank everyone who attended the event, the NJACS for co-sponsoring, Emmanuel Aouad for being a spectacular event photographer. This event was made possible due to contribution from the NJACS.